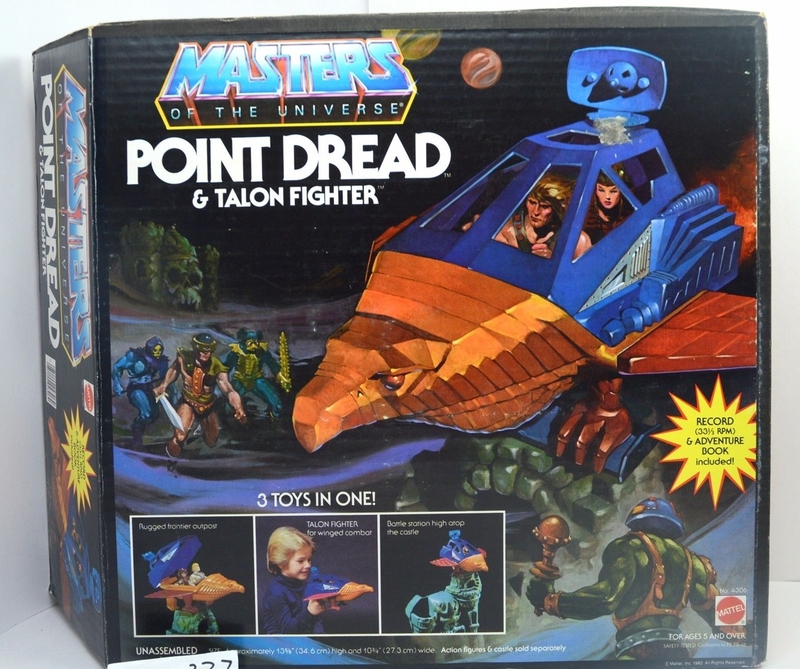 Point Dread and the Talon Fighter somehow completely slipped off my radar as a kid. I probably saw it represented in cross sell art form at some point in my childhood, but I don’t think it ever made an impression. 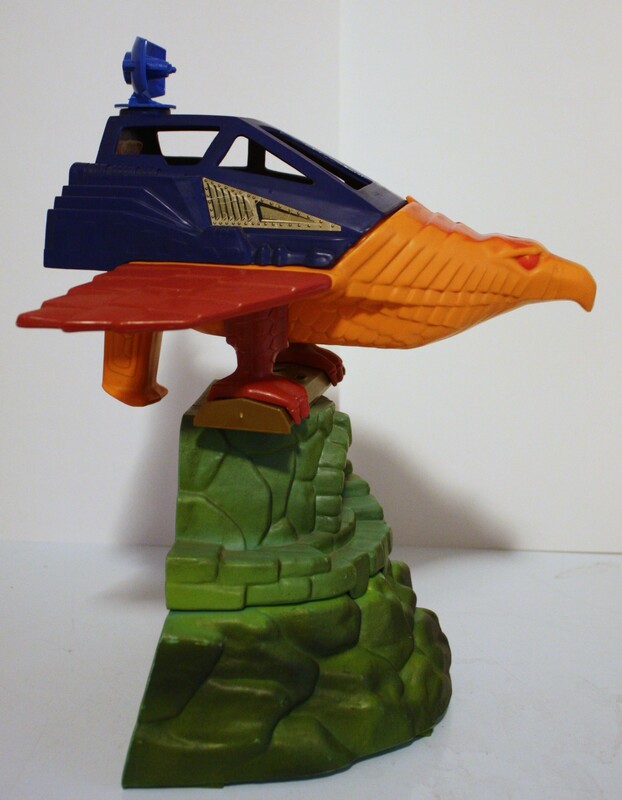 And that’s a shame because it’s one of the coolest items ever produced for the Masters of the Universe toyline. It’s certainly one of my favorites now. 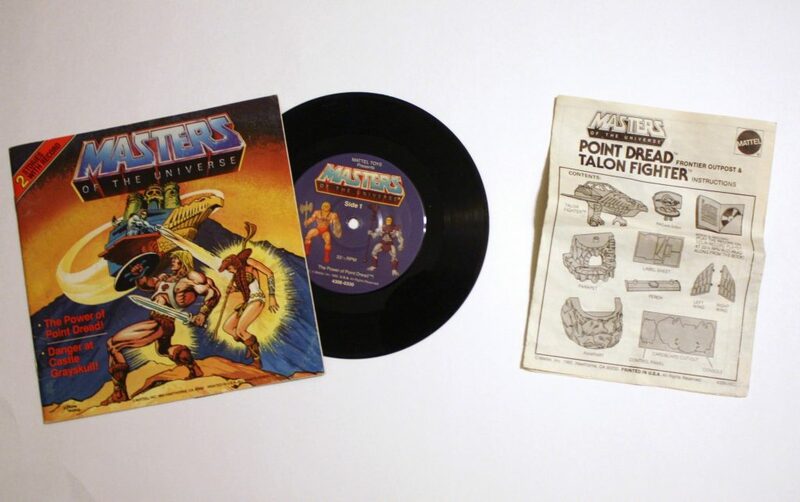 Point Dread and the Talon fighter was a rather unique item, in that it combined a small playset with a vehicle as well as a story book with record. 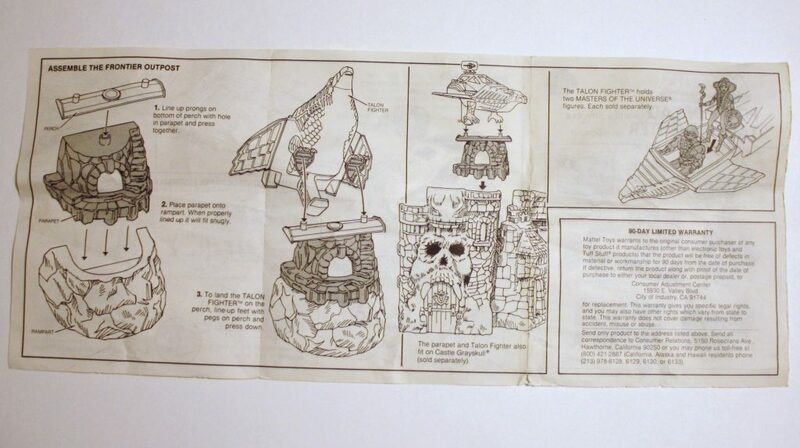 From my interview with Mattel designer Ted Mayer, I learned that the idea for the Talon Fighter originated with a sketch for the Eternia playset. 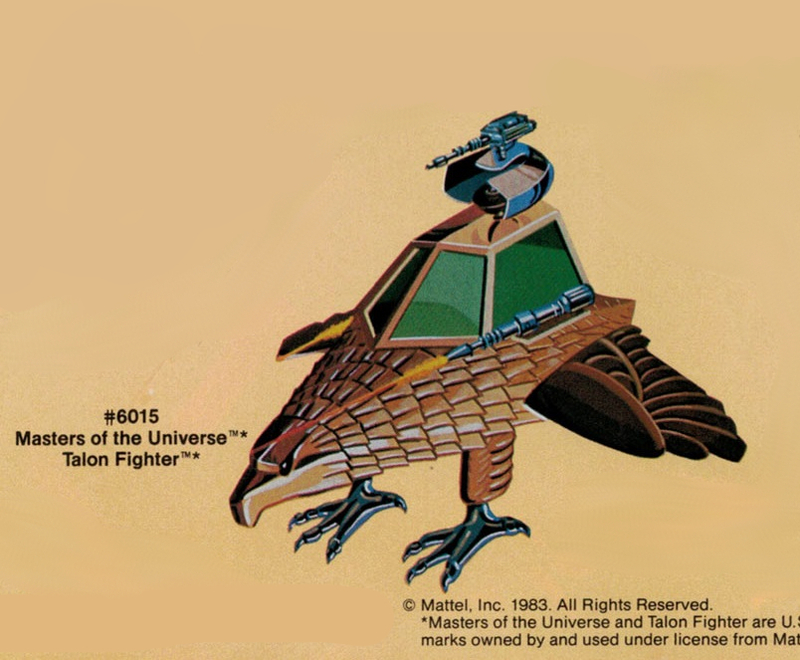 There are a couple of those in existence, and both seem to feature a flying vehicle that bears some resemblance to the final Talon Fighter design, although the aircraft in the second image also resembles the Blasterhawk. 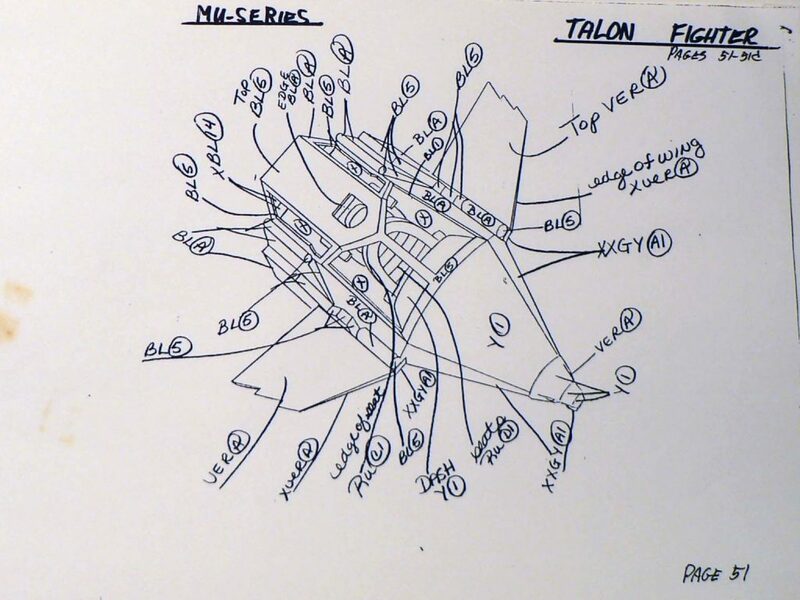 The second image is dated February 5, 1985, so it would not have been a source used for the Talon Fighter. 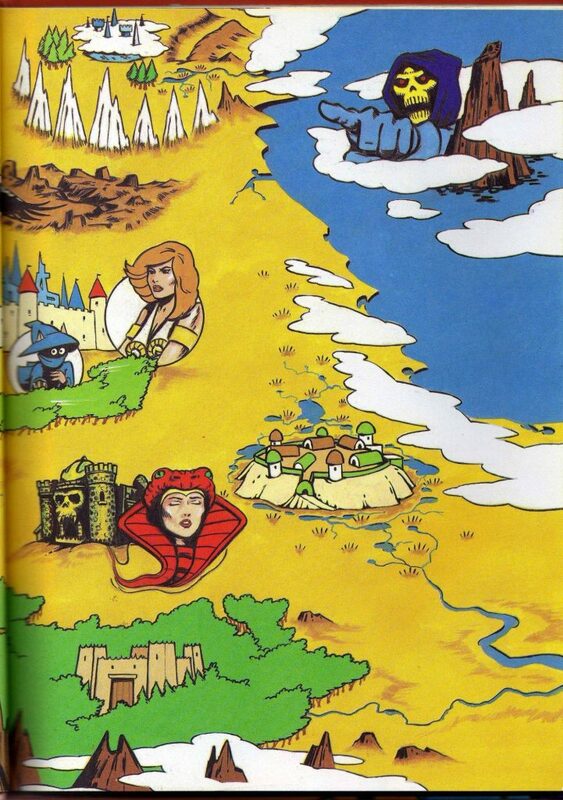 I would guess that the first image (called Mount Eternia) dates from some time in 1982. 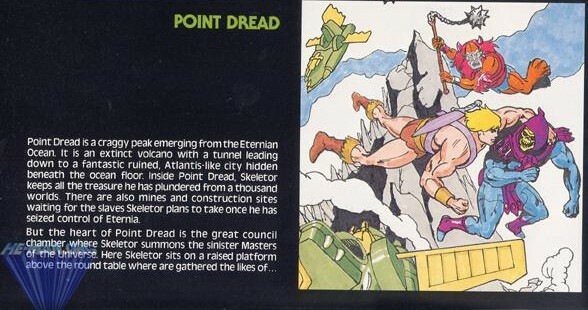 “Point Dread is a craggy peak emerging from the Eternian Ocean. It is an extinct volcano with a tunnel leading down to a fantastic ruined, Atlantis-like city hidden beneath the ocean floor. 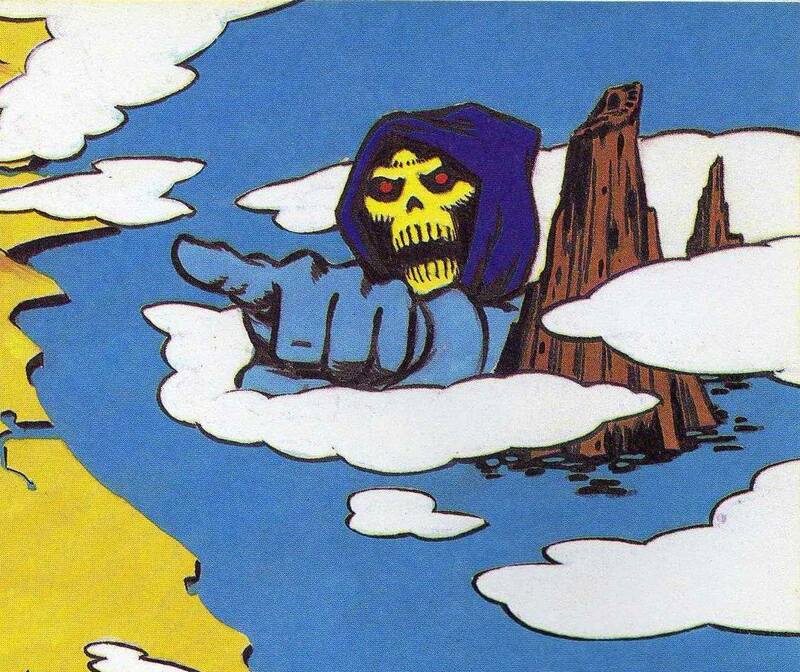 Inside Point Dread, Skeletor keeps all the treasure he has plundered from a thousand worlds. 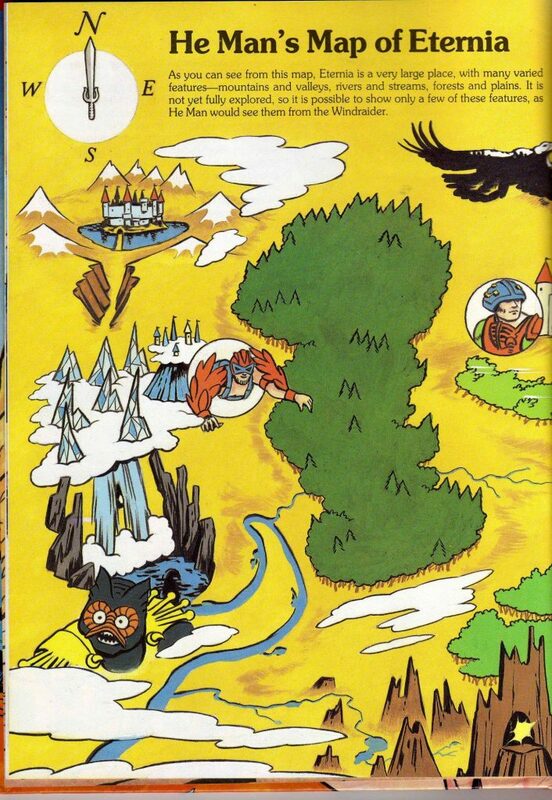 There are also mines and construction sites waiting for the slaves Skeletor plans to take once he has seized control of Eternia. 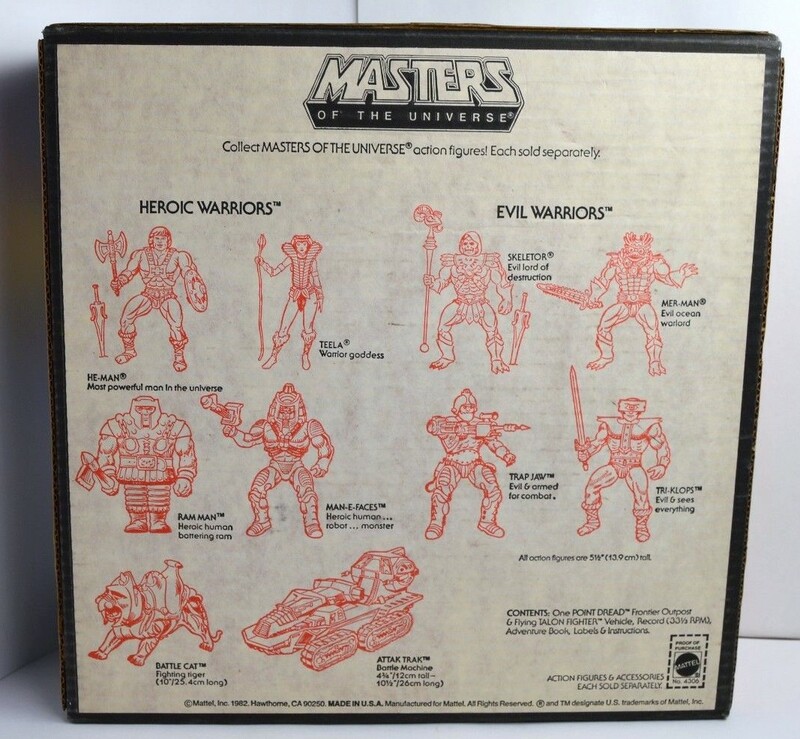 Notice that at the evil warriors are referred to as the “sinister Masters of the Universe”. 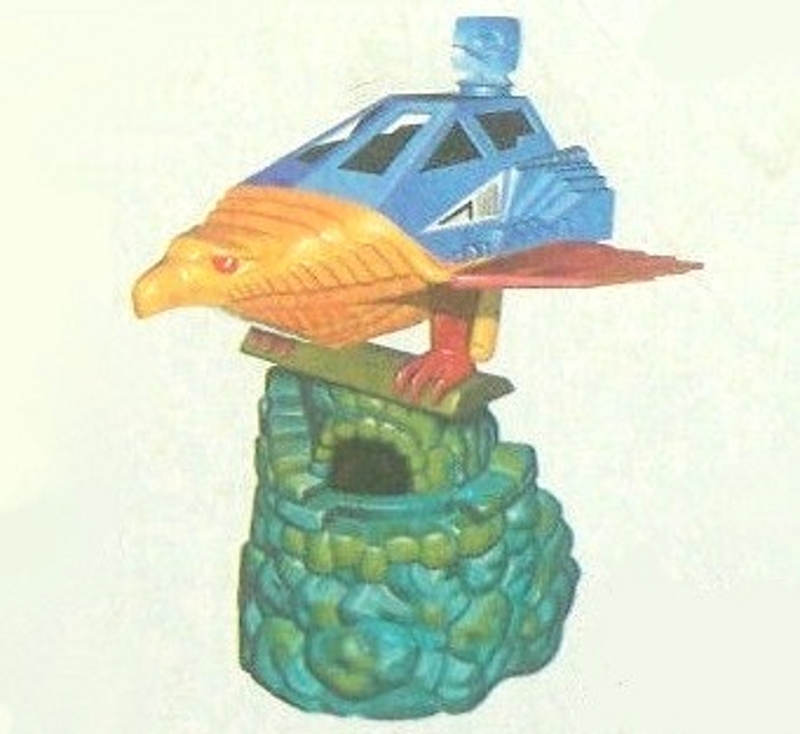 The same guide describes Talon Fighter as an agile air vehicle that only He-Man can control, and says that it is frequently perched atop Castle Grayskull. 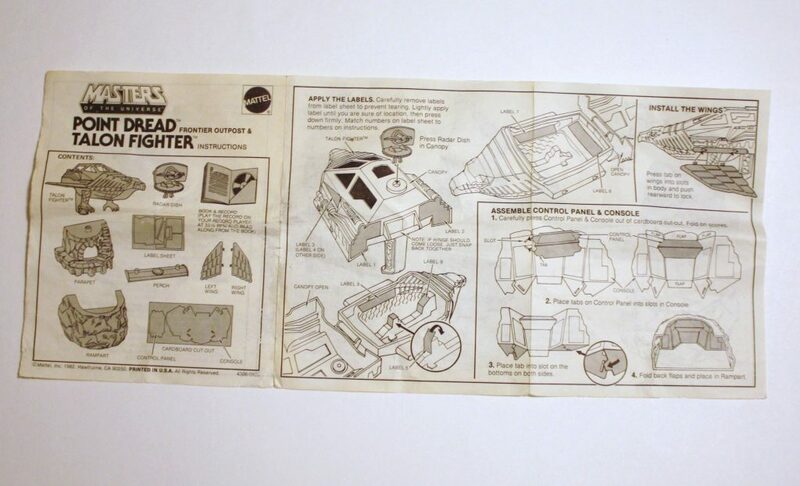 The top of what we would refer to as the Point Dread playset is also shown – perhaps at the time the rocky base for the Talon fighter was not yet named. 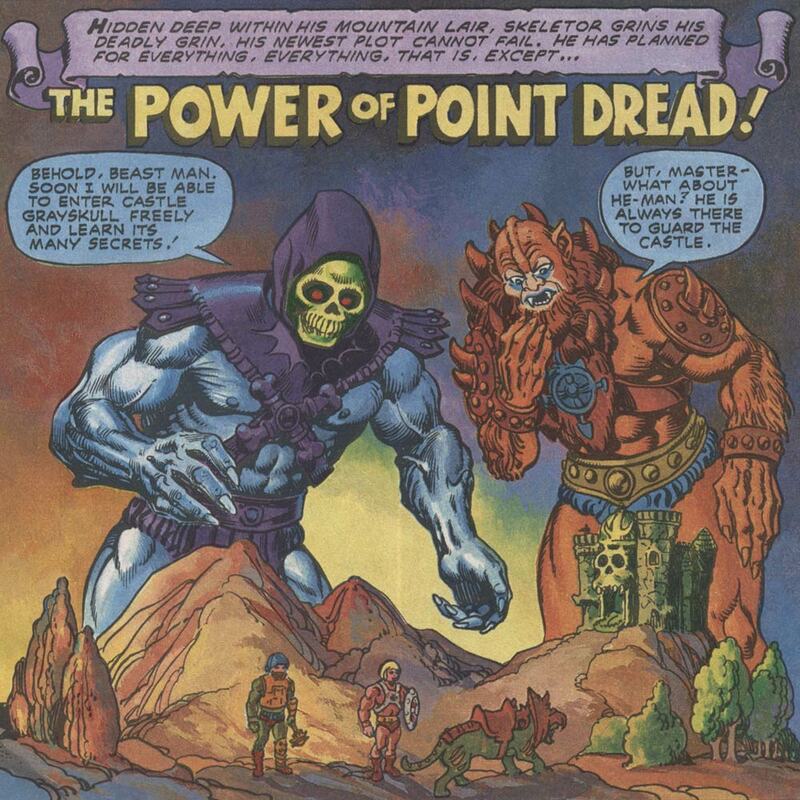 It may have taken on the name of Point Dread after Skeletor’s home base was identified as Snake Mountain. 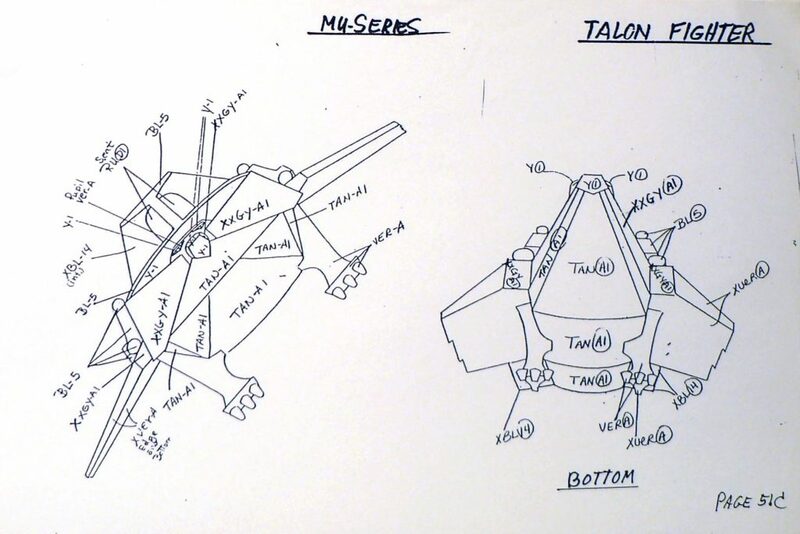 The Talon Fighter seems to be based on something like a hawk or an eagle. 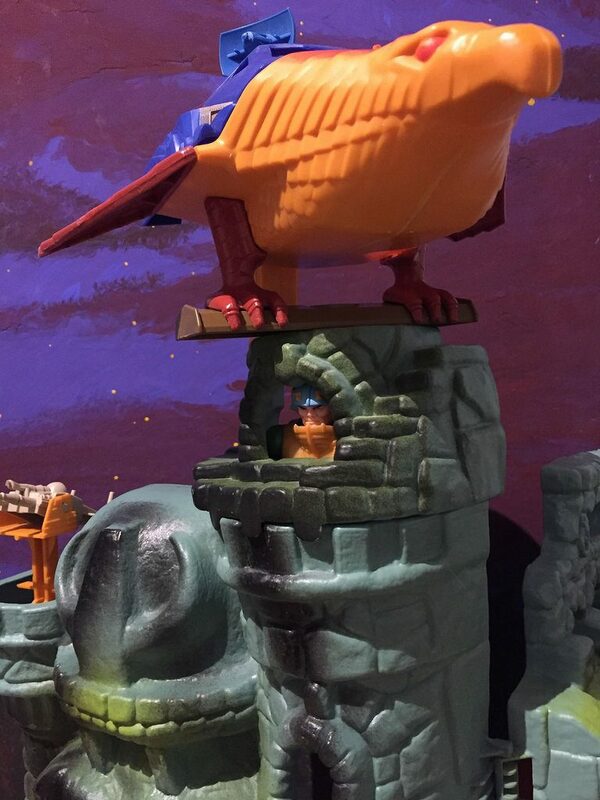 It has a rather wide body, stubby, downturned wings, and curved talon feet. 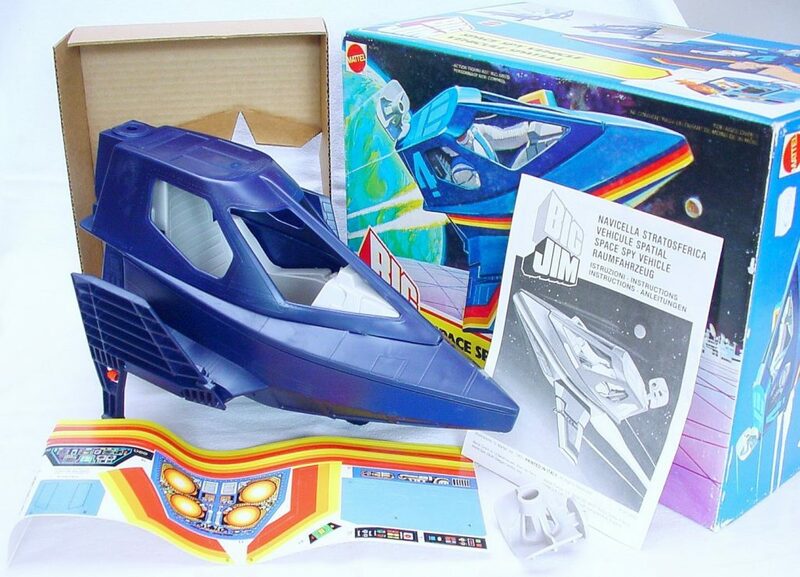 There is room for two figures inside the roomy cockpit, and it features a handle on the back for easy zooming around the house. 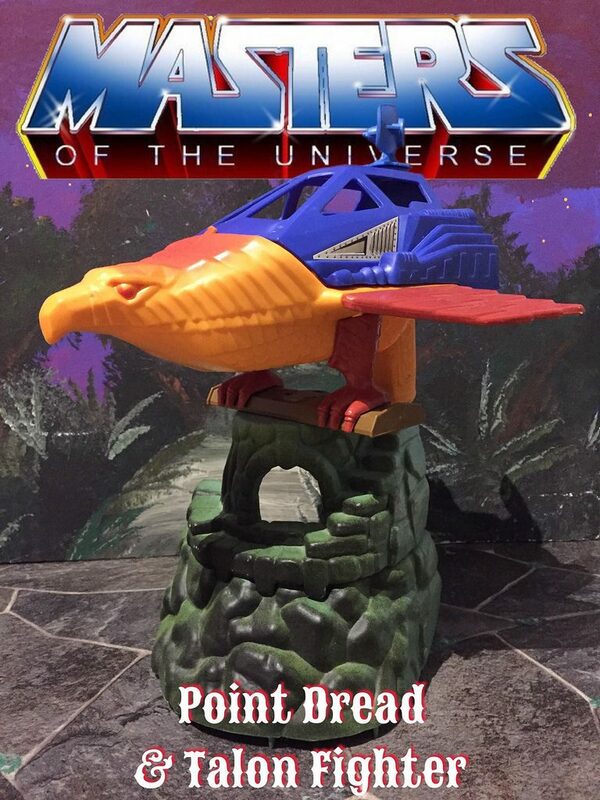 Point Dread (tag line: frontier outpost) is a simple two-piece shell with a window and rather small stairs leading upward on the top piece. 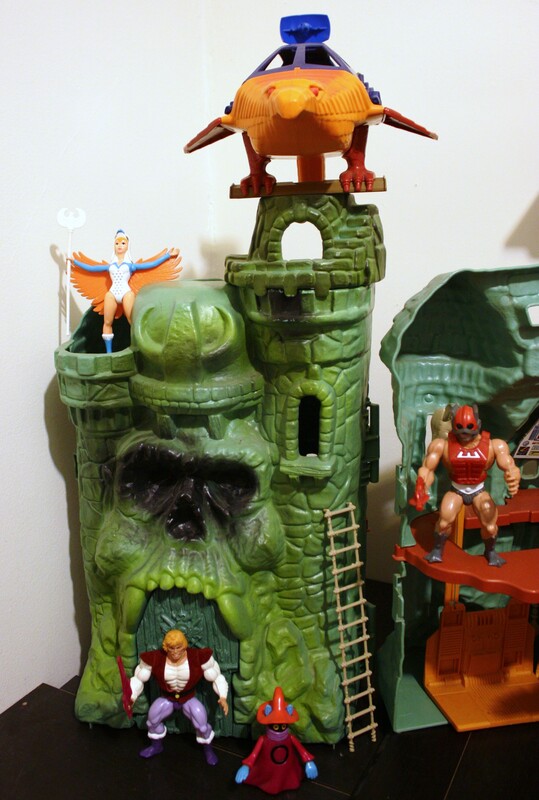 The top piece can clip to the tallest turret on Castle Grayskull. 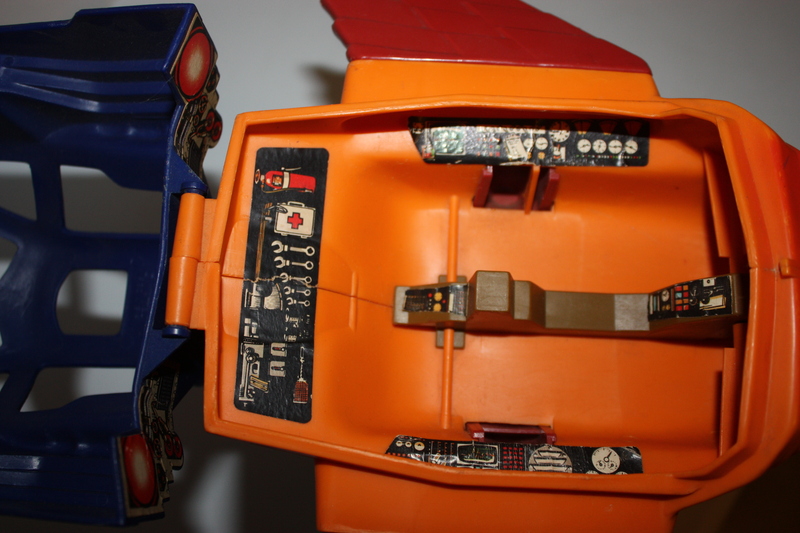 Inside the lower half is a cardboard control panel. The box art is rather magnificent, in my opinion. 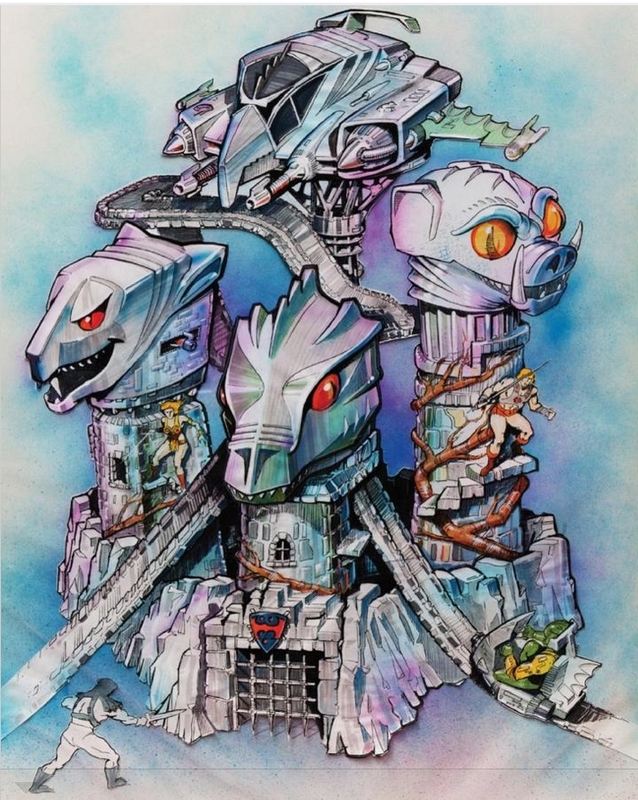 The artist is unknown, but they seem to have been trying to imitate the style of Rudy Obrero. 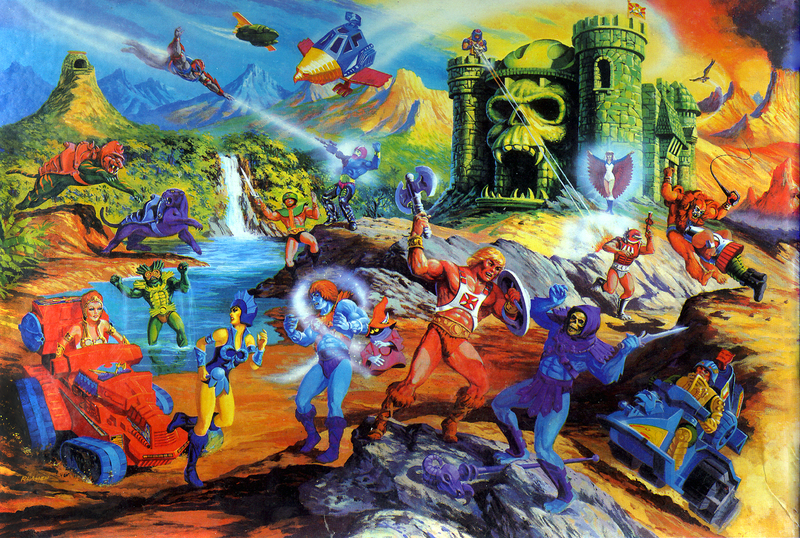 The artwork features Skeletor, Tri-Klops and Mer-Man launching an assault on Point Dread. 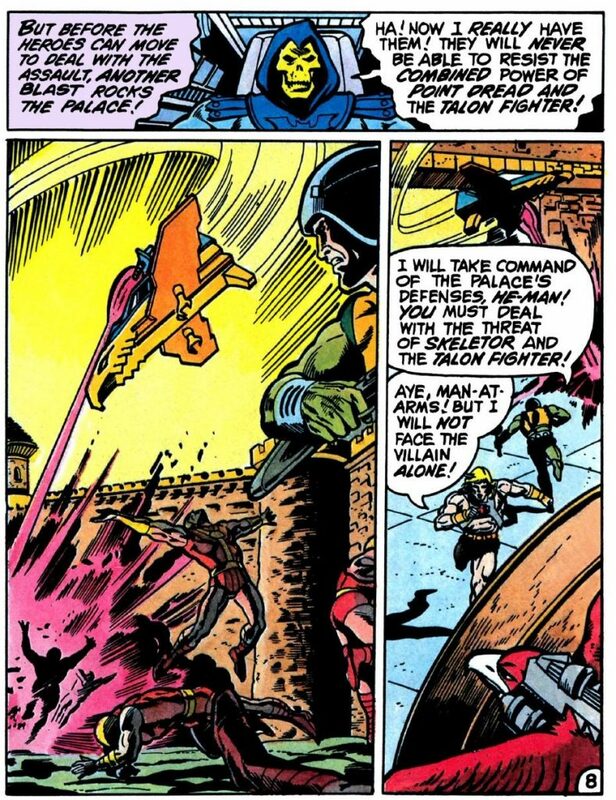 He-Man and Teela are inside the Talon Fighter, and Man-At-Arms seems ready to take on the villains from the ground while his friends attack them from the air. 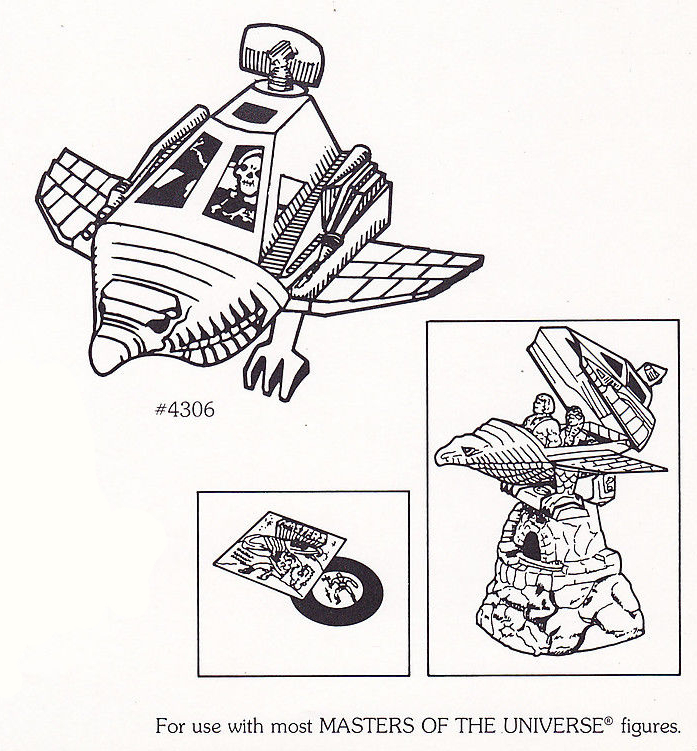 The comic book included with the playset is one of my very favorites. 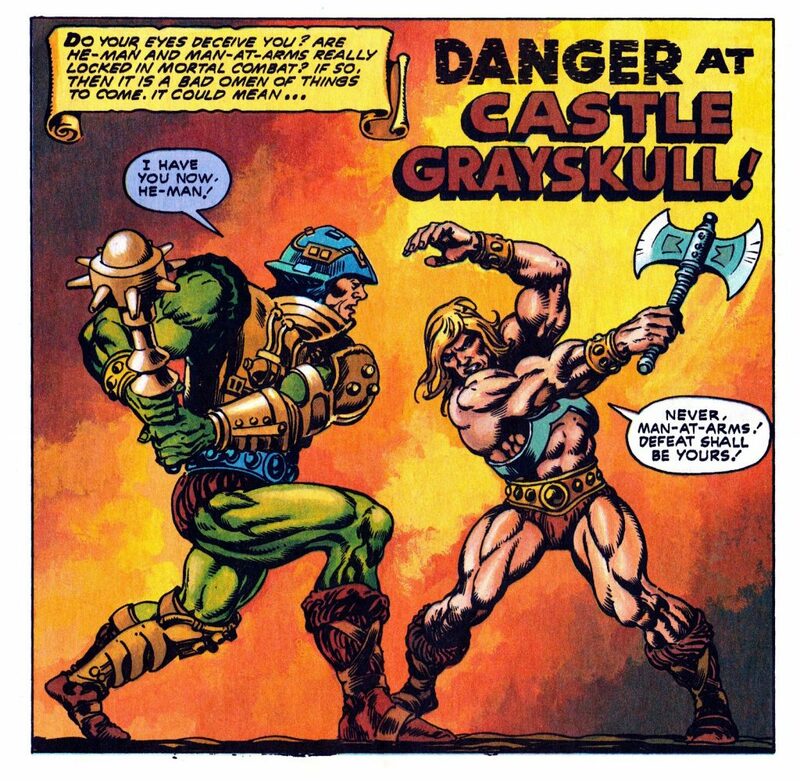 It’s two stories in one book – The Power of Point Dread and Danger at Castle Grayskull. 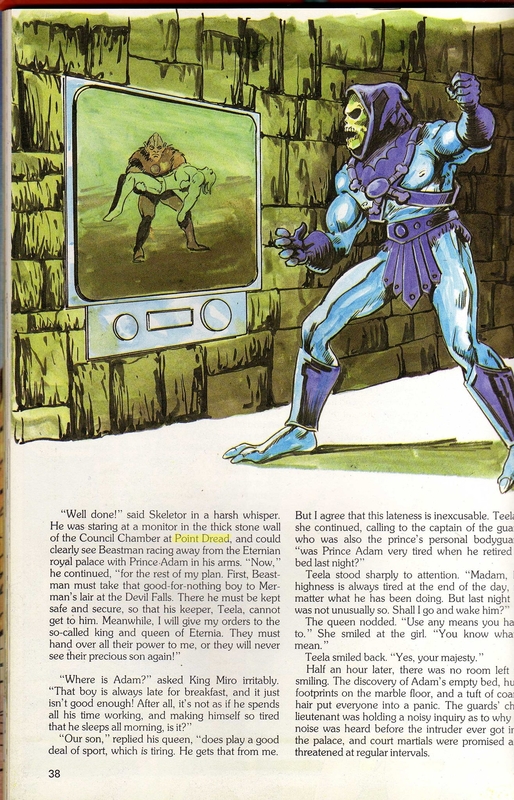 The artwork is by the incomparable Alfredo Alcala, and features some fun and colorful stories that introduce us to not only PDTF, but new characters like Man-E-Faces, Trap Jaw and Tri-Klops. 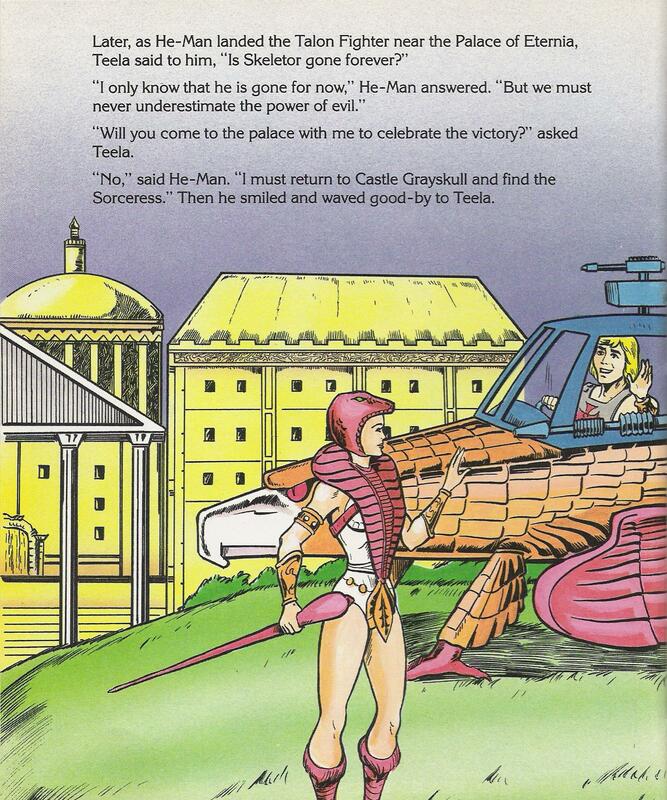 Zodac has a rather prominent role to play in the first story, which is a nice touch. You can ready both stories in their entirety here and here. 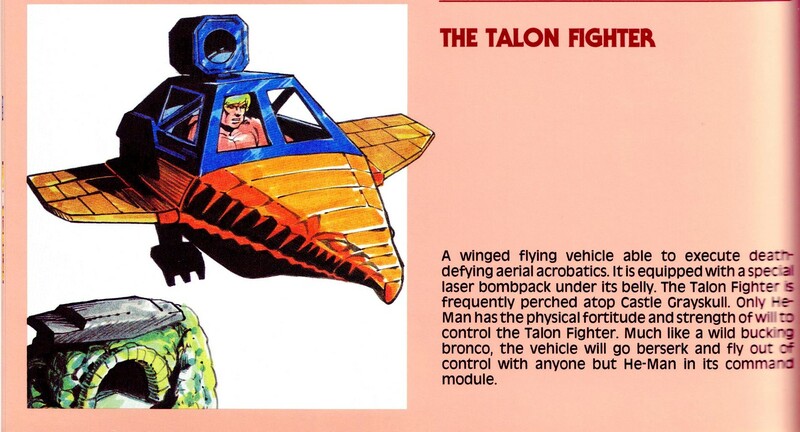 TALON FIGHTER – this winged flying vehicle carries two passengers and is able to execute death-defying aerial acrobatics. 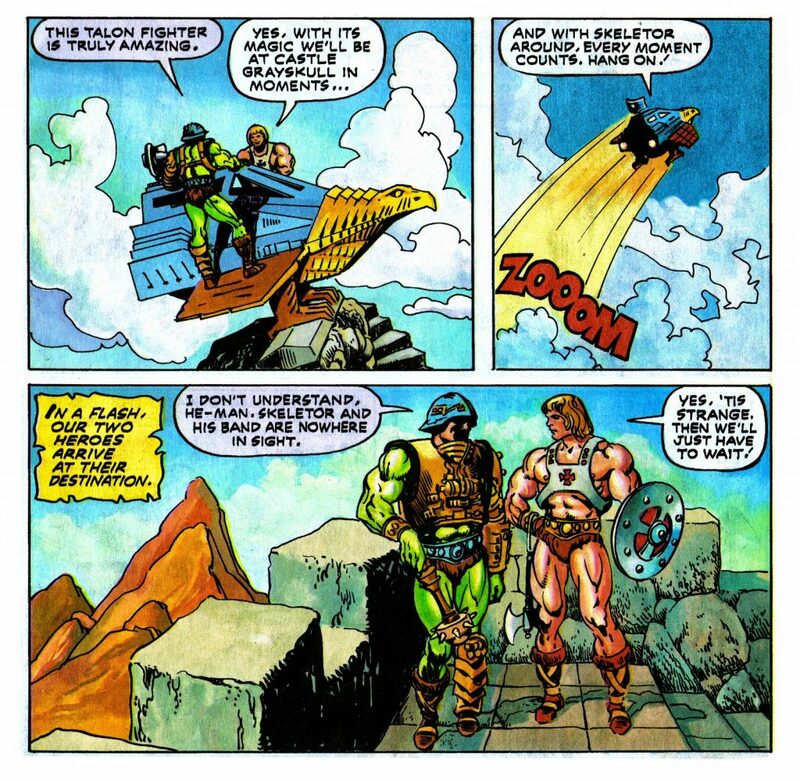 Equipped with a special bombpack under its belly, He Man can call the fighter when it’s needed. Its resting place is atop a far peak called PT. 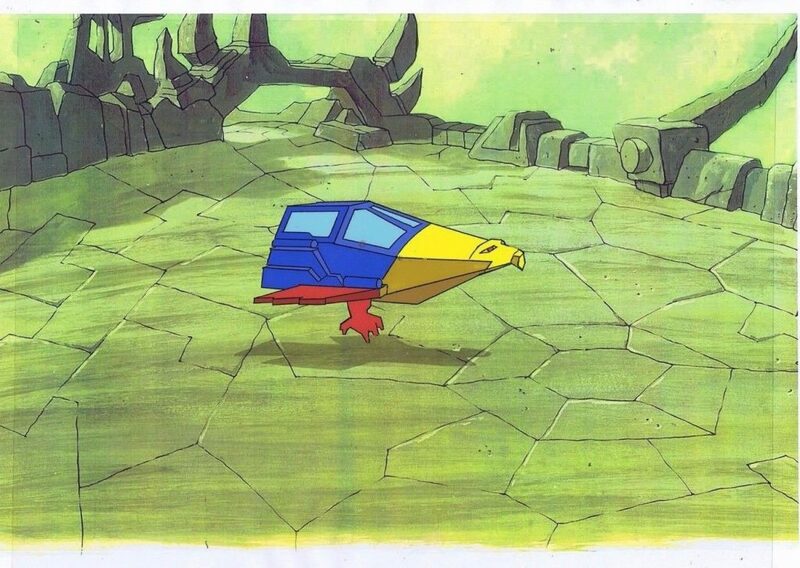 DREAD which materializes whenever the Talon Fighter comes to rest. 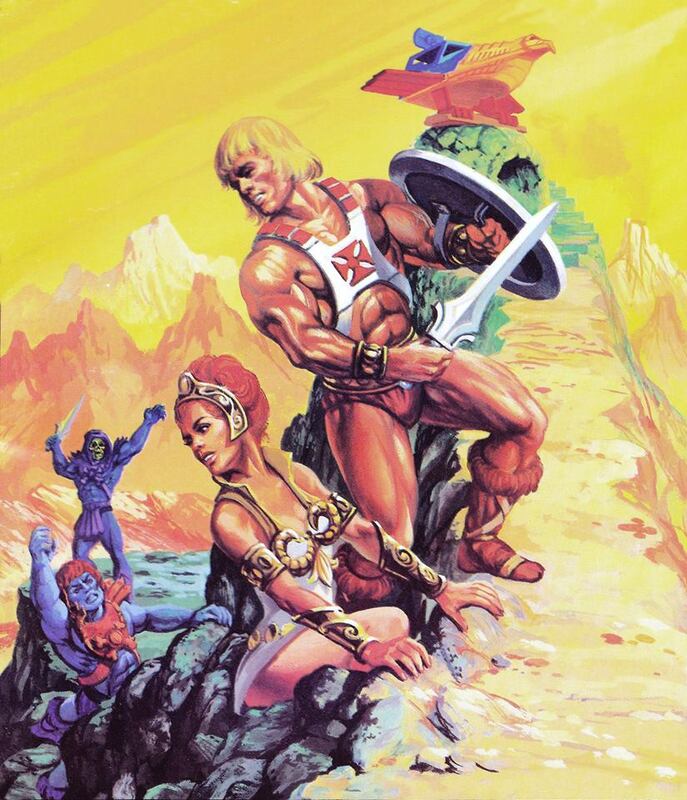 Only He Man has the physical fortitude and strength of will to control it. 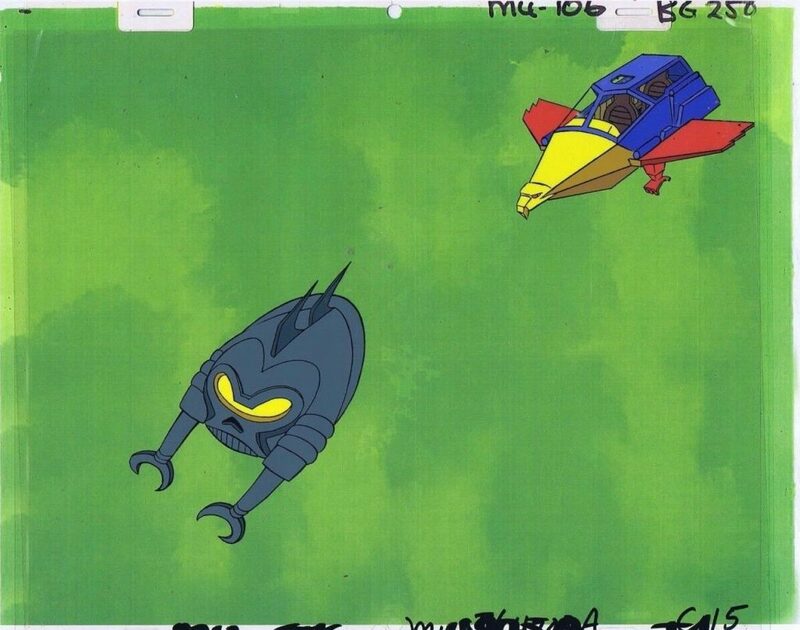 The flying machine goes out of control unless He-Man’s in command. 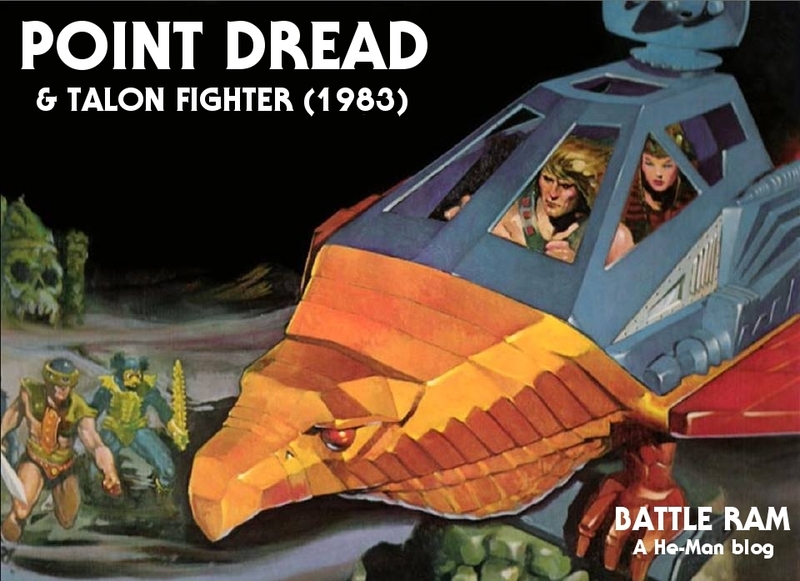 Point Dread never made an appearance in the Filmation cartoon, and the Talon Fighter was used quite rarely. 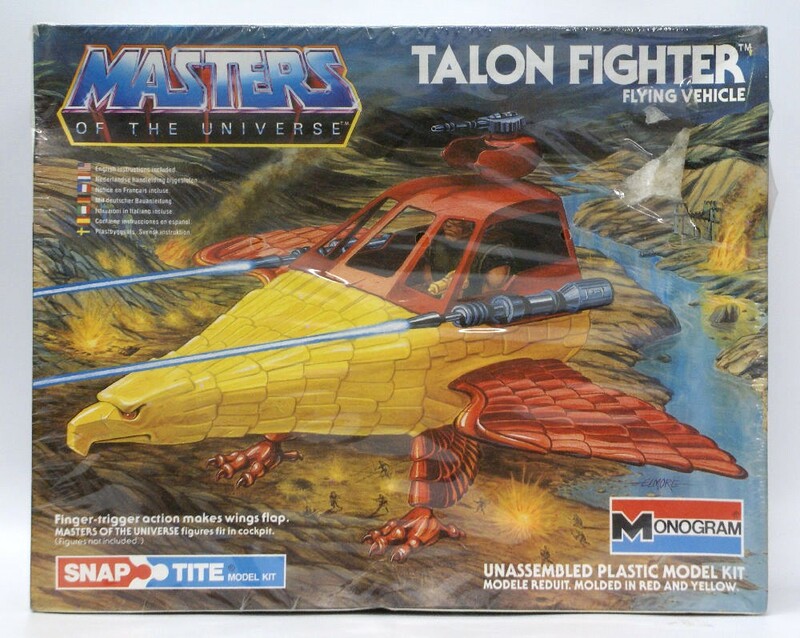 There was also a kit version of the Talon Fighter produced by Monogram (which was owned by Mattel at the time). 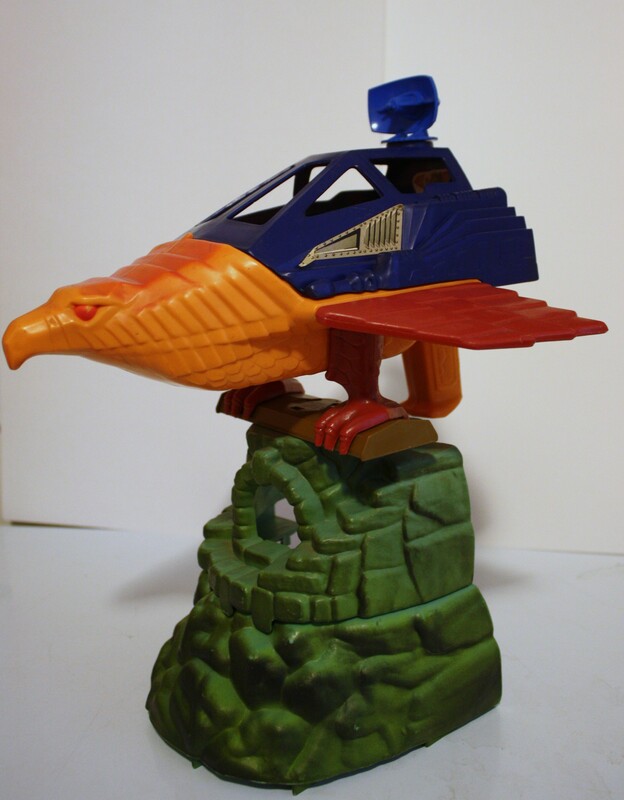 It had a much more bird-like design than the toy, and a simpler yellow and red color scheme. 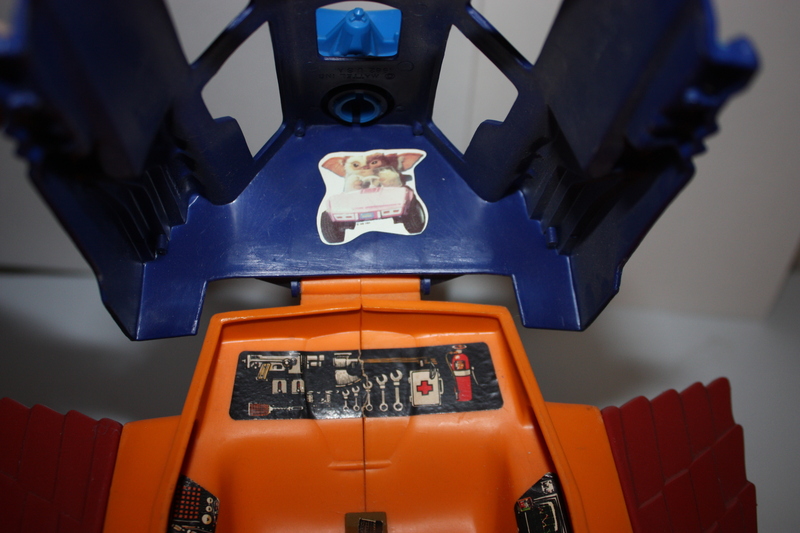 It also has a canon mounted on top of the cockpit, rather than the radar design of the toy version. 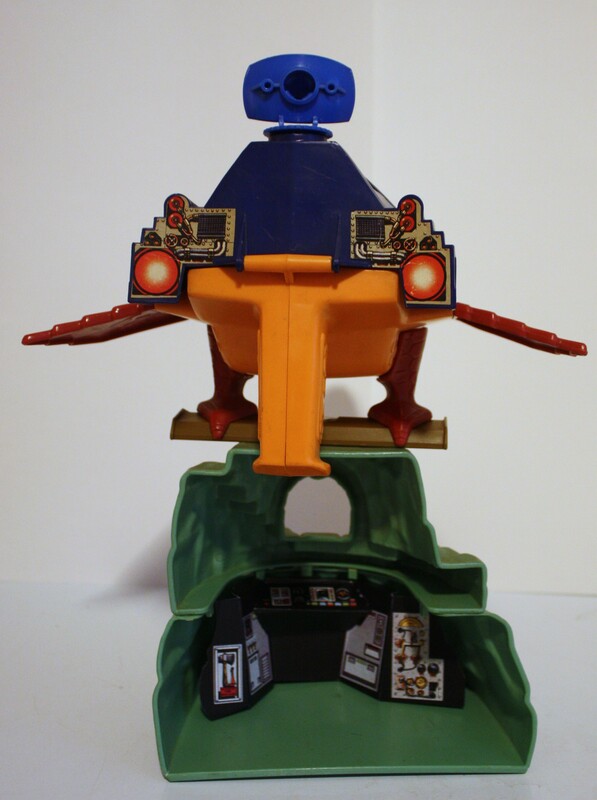 Monogram also produced versions of the Attak Trak and Roton. 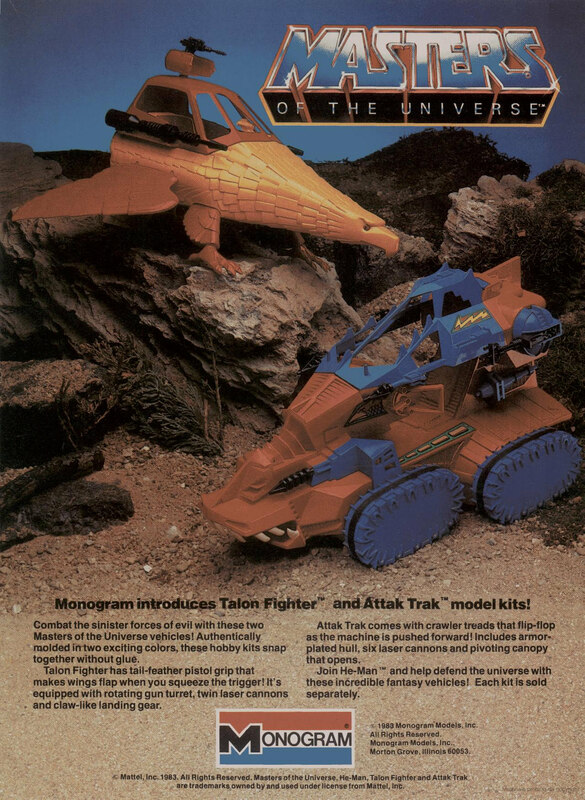 The Monogram Attak Trak is based off of a concept version of the Attak Trak, so I wonder if the same isn’t true of the Monogram Talon Fighter. 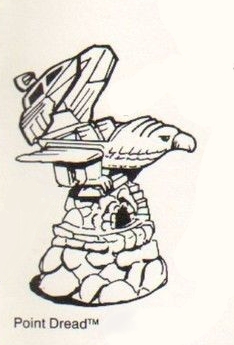 For the Kit version, I would say Eagle without a doubt. as for the text signature on the image? Hang on..in that advert.. the LP has Victor Caroli as the Narrator? sure sounds like him when they play the LP, but doesn’t quite sound like him doing the advert or the Final LP…. in fact it’s clear that the LP on the Advert wasn’t the final release. the dialogue is similar but not the same at all. I wasn’t aware Caroli was working for Mattel at the time.. and if he was, why replace him.. maybe it’s just distorted to sound like him for me.. anyone know? 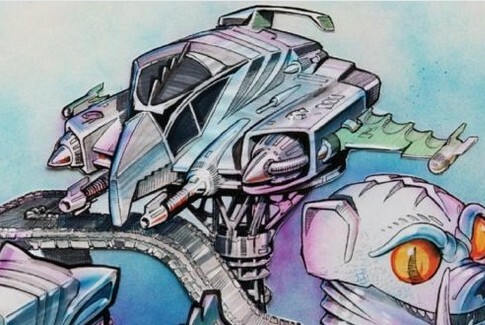 I wonder if the Talon Fighter and the Blaster Hawk share the same design DNA. 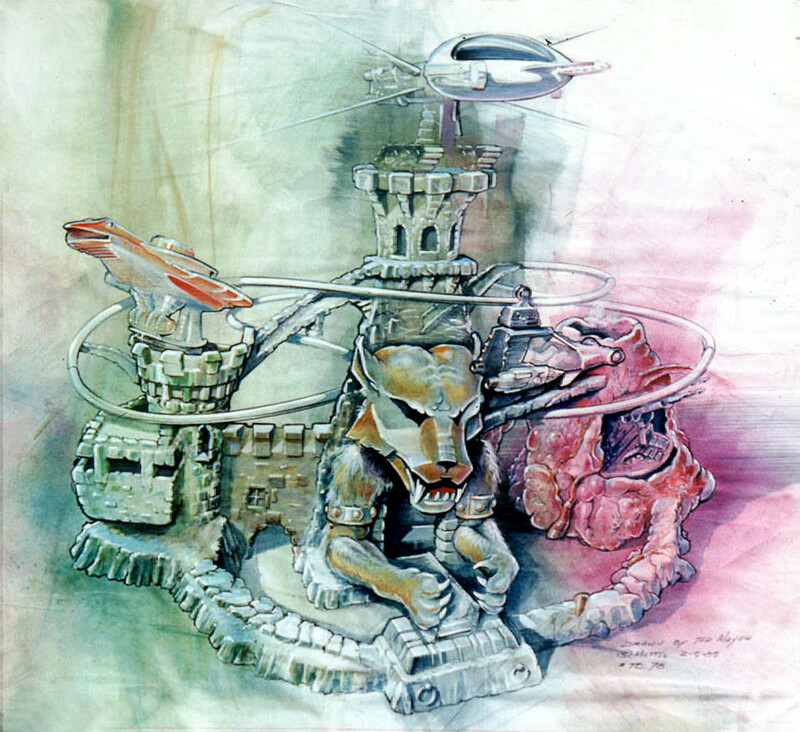 The reddish example from the second Ted Meyer sketch reads closer to the Blaster Hawk to me; it also has a pistol grip and it shares a similar color scheme. 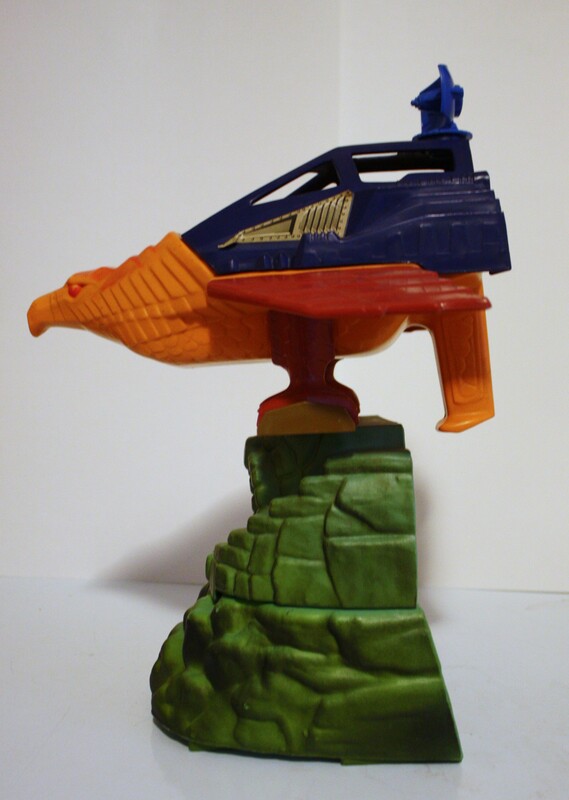 It would also be compatible with the cannon mount on top of the Eternia play set; another similarity to TF attaching to PD. 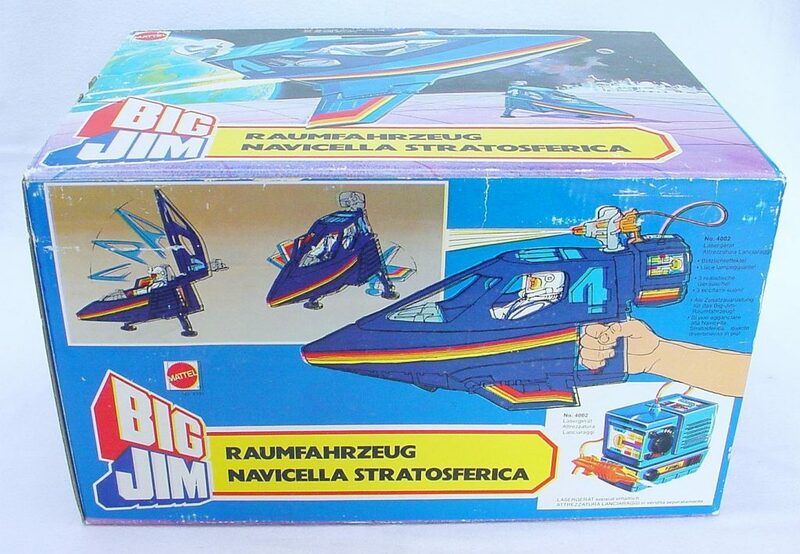 Hi Christoph, I wouldn’t be surprised if that was the genesis of the Blasterhawk starts there. Also the Fright Fighter from the same drawing! 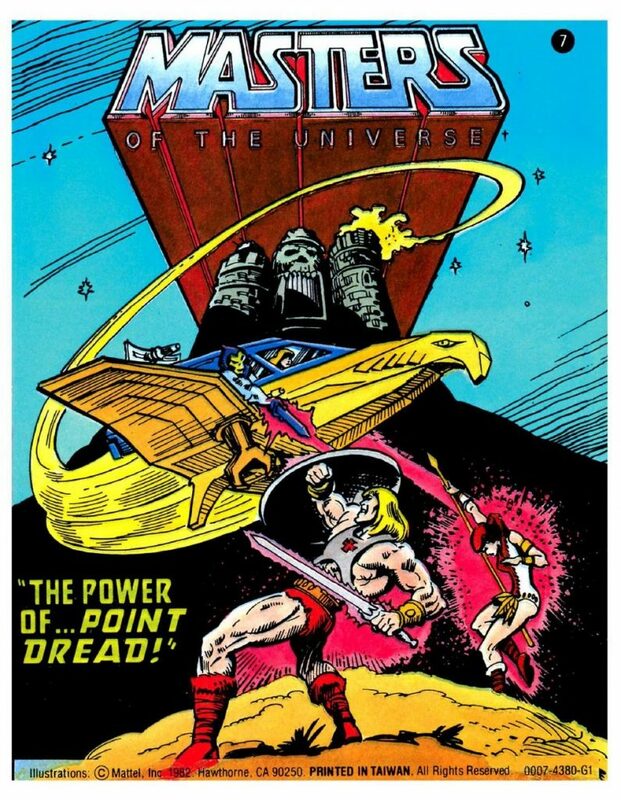 There’s a great novelization of the ‘Power Of Point Dread’ minicomic and the story record, written by T. F. Stephens, and it’s the best use I’ve seen of Point Dread in anything fan-created. For whatever reason, Pt. 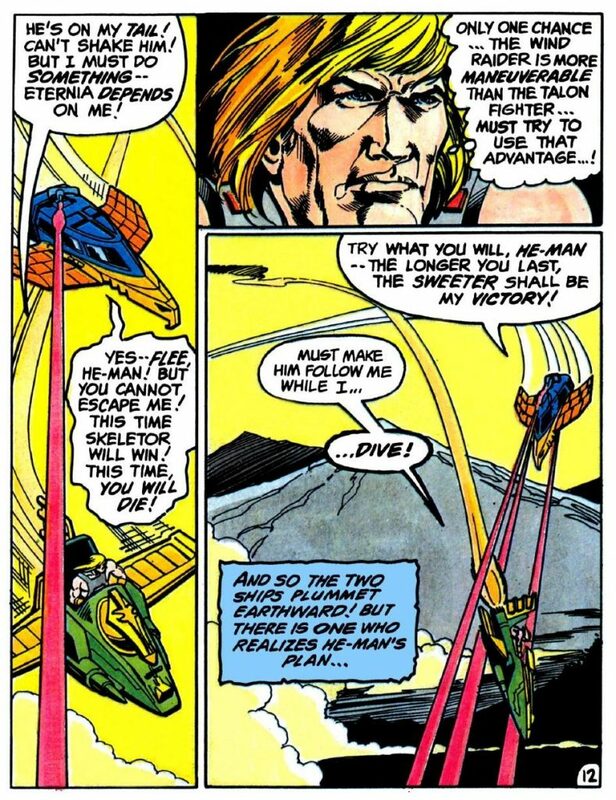 Dread never seemed to catch fire with fans, and I’ve never understood that, because Mini-ternian master, Gary Cohn, made Dread a great, enigmatic addition to the Masters mythos. Even if you don’t read the entire novella, just check out Part 4, “Death Sky, Come Ahead”, and be swept back into how you felt, when you first set eyes upon Point Dread. 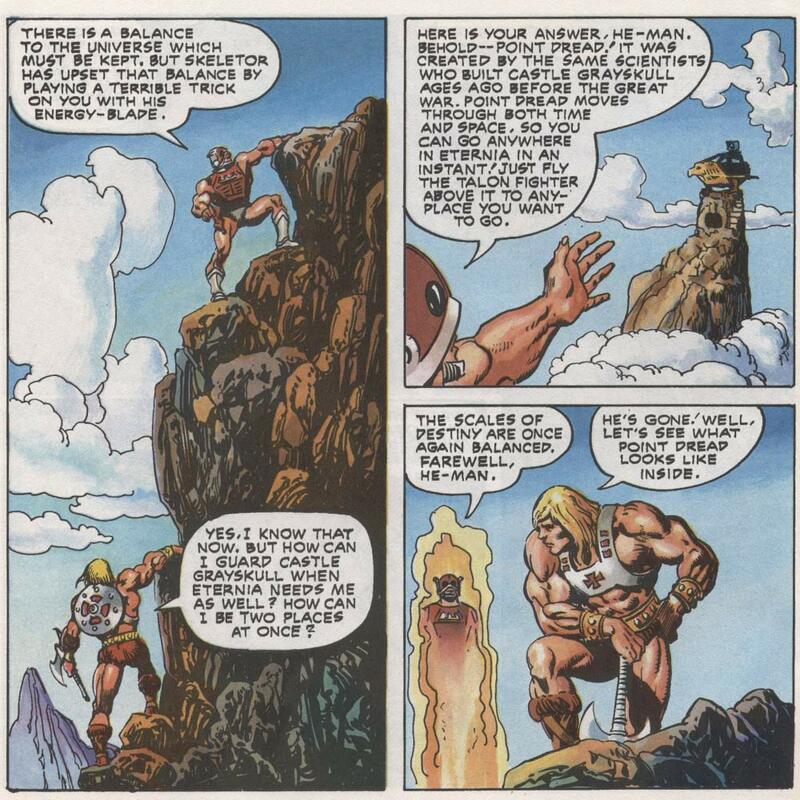 Here’s “Death Sky…” on T. F. Stephens’s Savage He-Man site. What size were those kits? 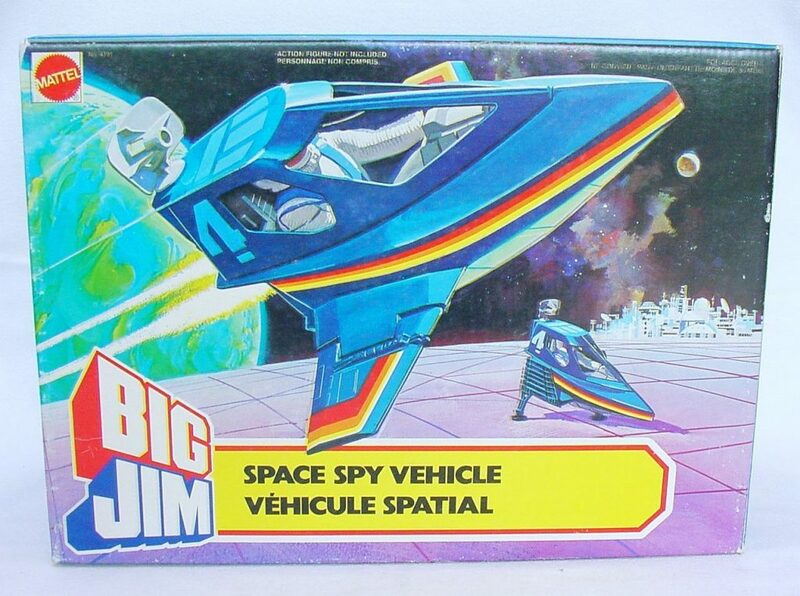 I always wanted kits that had figure-ish sized vehicles. I believe they’re in scale with the figures. without one to hand for reference, I can 99% comfirm they are figure scaled.. the “Masters of the Universe figures fit in cockpit (Figures not included) is a bit of a give away..
Another awesome vehicle (that I never had XD). 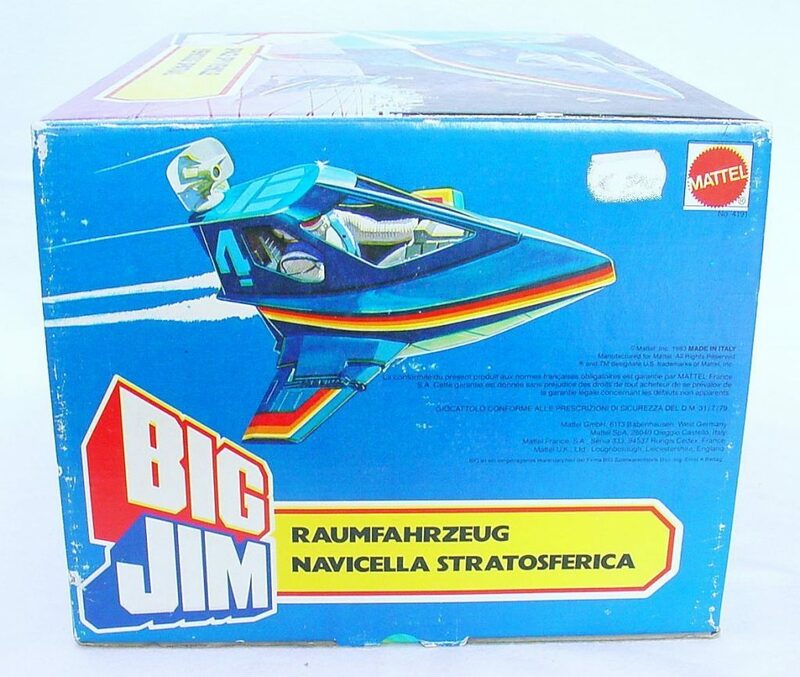 As a kid I never noticed that it can carry two figures inside the cockpit and that is a rare feature for the time. 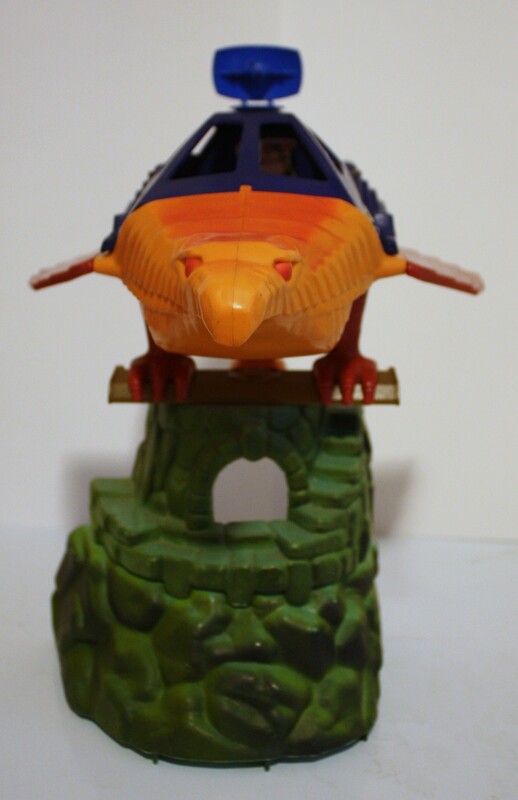 The only little disappointig thing is that only the upper half of Point Dread can actually combine with the Castle. 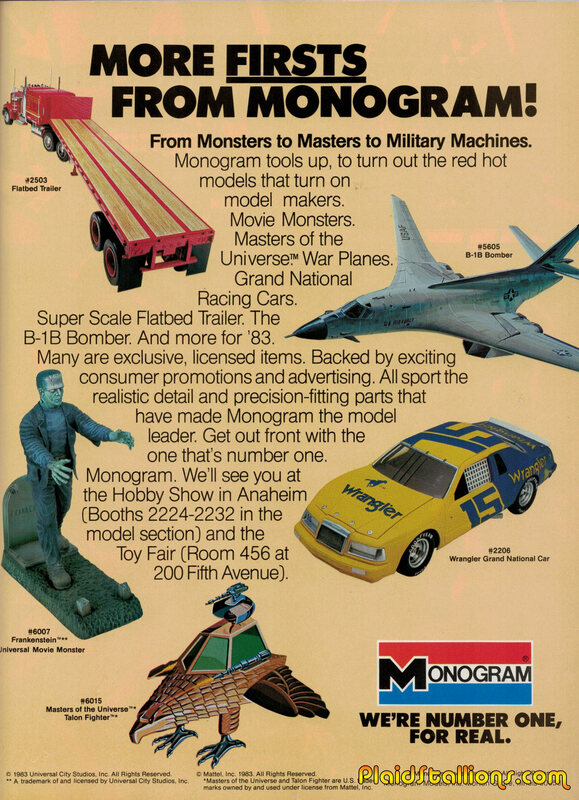 The Monogram model kit is cool but is my least favorite, because for my tastes it looks too much animal and too less vehicle: the real toy has a more balanced look in my opinion. 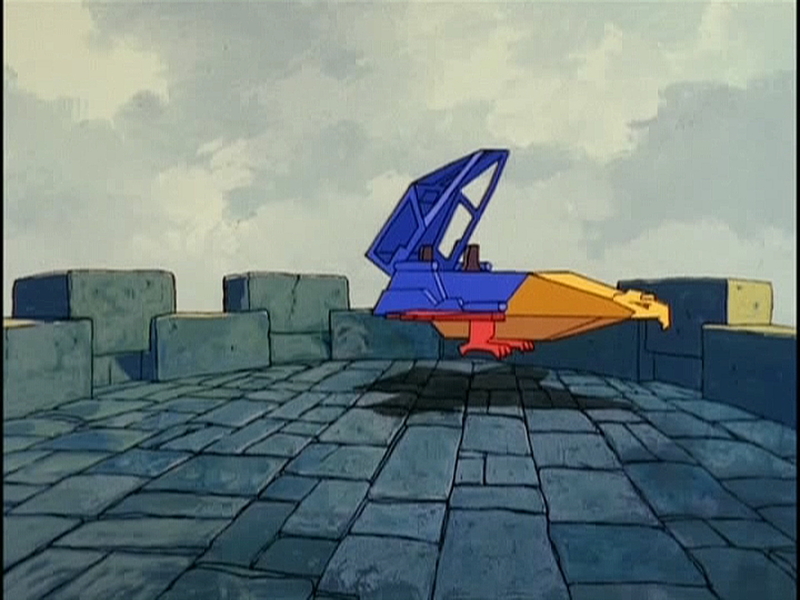 Concretly, in what episodes of Filmation cartoons the Talon Fighter appears? this blog is amazing. thanks so much for putting all this info together in one place! it really takes me back. 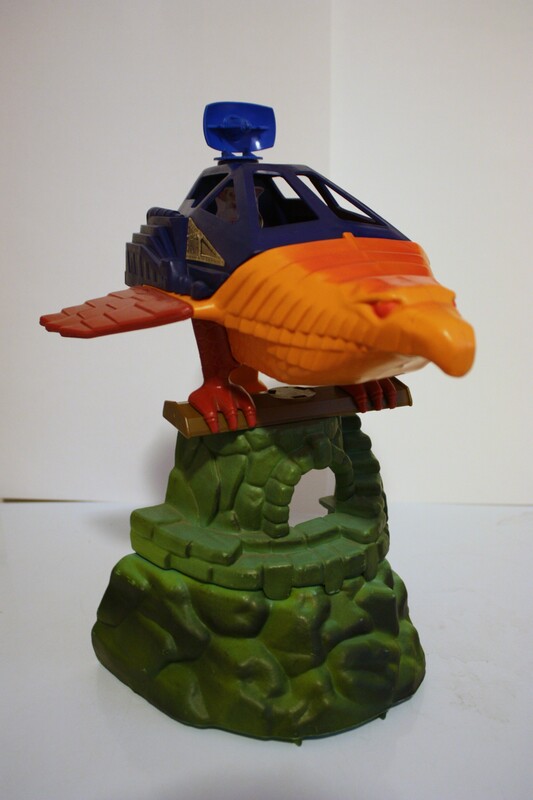 PDTF was one of my first playlets (I was born in 81) and remains my single favorite childhood toy now 30+ years later.